It’s Spring Break time! 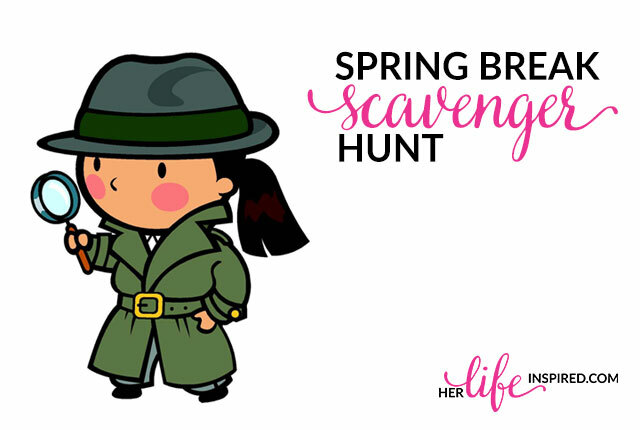 If your family is having a staycation like we are, I’ve got a fun way to rediscover your city with a Spring Break Scavenger Hunt. Whether you are new to a city or have live there for years, this scavenger hunt will give you a chance to explore your city through the eyes of a tourist. You might be surprised by all of the hidden gems right in your own backyard during this little adventure! I lived in Philadelphia for almost 20 years and I never visited the Liberty Bell. Never visited the Betsy Ross House. Never visited Independence Hall. Never visited the Ben Franklin House. And the list goes on. Now that I live so close to the nation’s capital, I want to make sure my family takes time to learn all about the history and culture of the city before we become jaded and start taking it for granted. So last year, I decided that a scavenger hunt during spring break would be the perfect opportunity to have some fun and learn about the city on our staycation. Each morning I gave Journey an envelope with clues to where we would be visiting that day. Once she figured out where we were going and we arrived at the location, I gave her another envelope with a list of things she needed to find while we were there. We had so much fun that she couldn’t wait to do it again this year! 1. Identify the places you would like to visit. It can be places you have been before but haven’t visited in a while as many tourist attractions, museums, etc. are always rotating exhibitions and activities. You can also pick a few places off the beaten path that you have never visited before. Visit your city’s convention and visitors bureau website or travel websites like wikitravel.org to find a list of interesting places to visit. 2. As you are selecting your locations, come up with 3 or 4 fun facts that you child can search for when you get there. This adds a bit of a learning component to the scavenger hunt, but you can skip this piece if you feel it’s too tedious. 3. Come up with a simple, fun rhyme to give your child the clue to where you are going. Did you figure out the clue? It’s the National Museum of Natural History! 4. 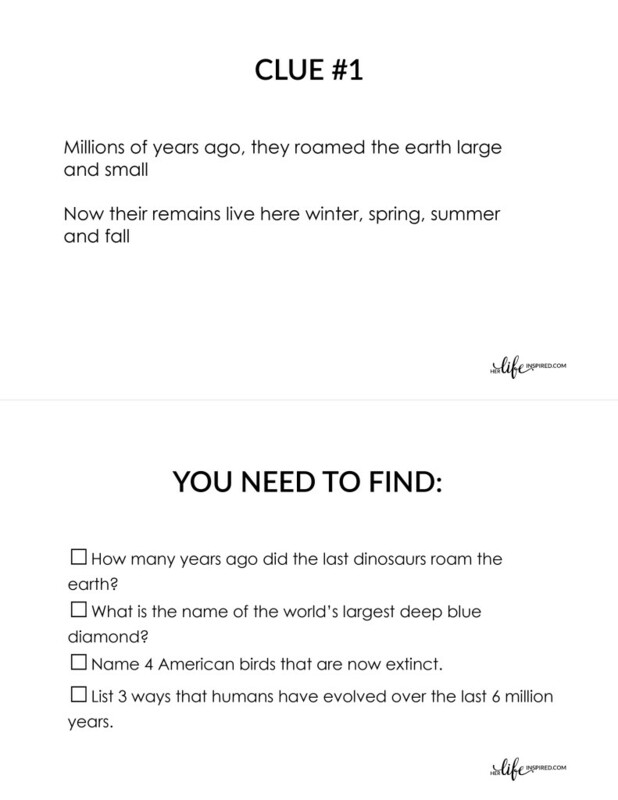 Print these Spring Break Scavenger Hunt cards to write your clues and fun facts. If you are going more than one place in a day, label your clues as Clue #1, Clue #2, etc. and print one card for each clue. Note, the cards are double-sided and should be cut in half. 5. Put each clue and each list of fun facts in a separate envelope. 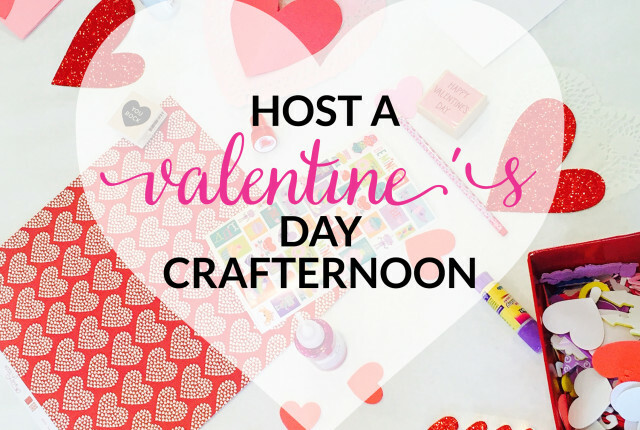 Although I call this a Spring Break Scavenger Hunt, this idea works during holidays, summer break, or anytime you want to do something different and have fun with your child! Perfect timing! Spring Break is next week and I don’t have anything planned. Yes, it’s so much fun! And I learned quite a bit as well.